Chiles Rellenos are one of the best known and loved Mexican foods. Chile relleno translates as “stuffed chile.” If you have never had them, they are Poblano chiles that are stuffed with pork, beef or cheese and then are battered and fried and served covered in salsa roja. Heaven on a plate. Don’t you agree? 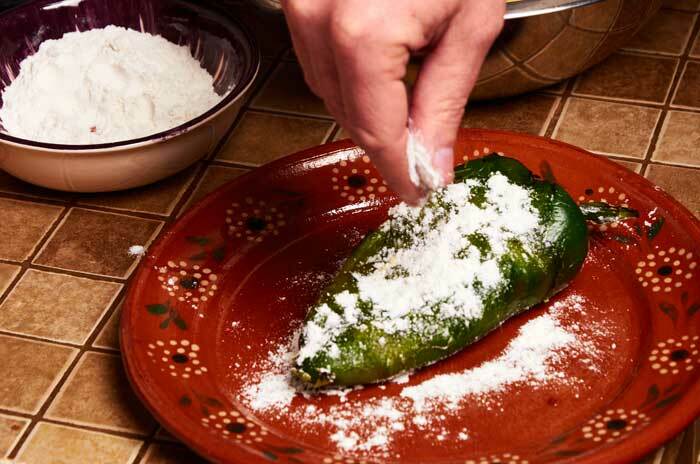 Follow the visual guide to prepare authentic chiles rellenos. The full printable recipe is at the end of the guide. Let’s get cooking! Don’t be intimidated by this recipe. It does take some effort to prepare, which is well worth it, but anyone can do it. 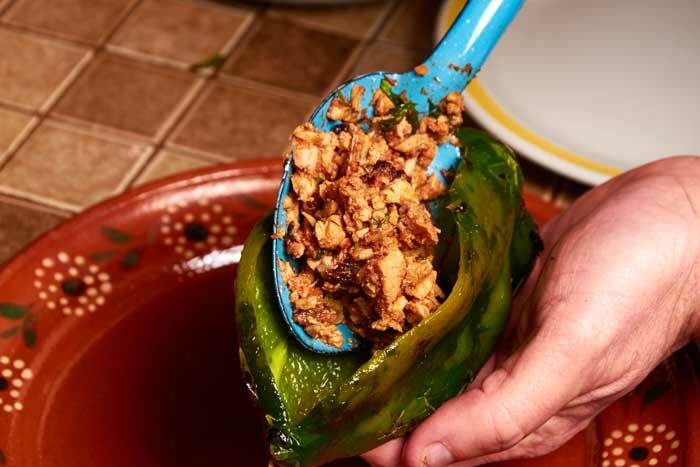 If you follow the guide carefully you will have prepared some amazing traditional chiles rellenos. All the ingredients for pork filled chiles rellenos. The recipe calls for Poblano chiles which must be cleaned before using. 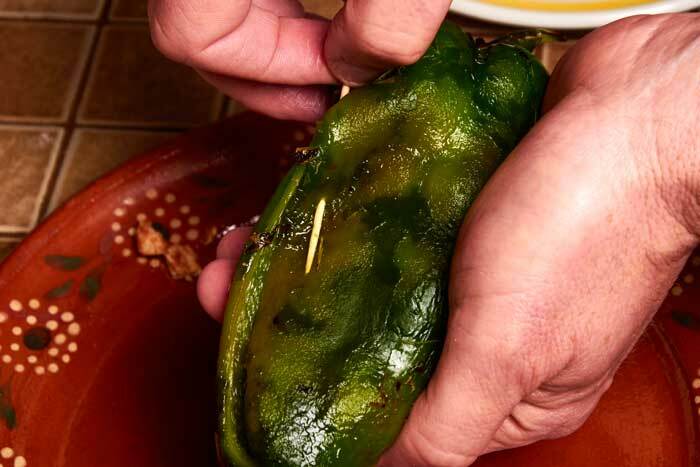 If you are not sure how to clean chiles, see our guide to roasting and peeling Poblano chiles. 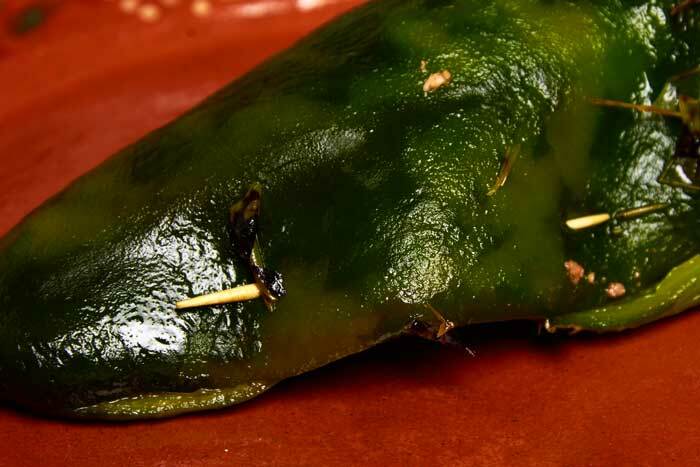 Poblanos are flavorful and only mildly hot and hold up well to stuffing. They are the traditional chile for making chiles rellenos. Pork filling for chiles rellenos. 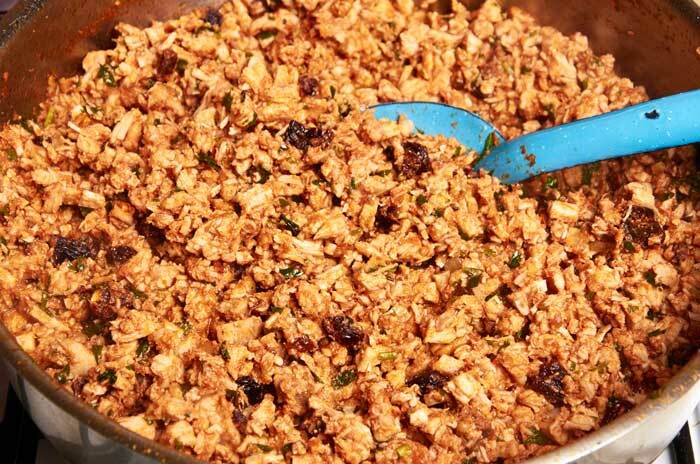 The pork filling for this recipe is adapted from a recipe in Diana Kennedy’s cookbook, The Art of Mexican Cooking. If this cookbook is not in your collection consider buying it. It’s a great resource for anyone who loves Mexican cooking. 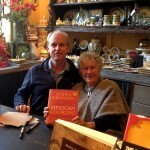 I was lucky enough to have Diana sign my copy at a book signing in San Miguel de Allende. Loin roast is a good cut for this dish. 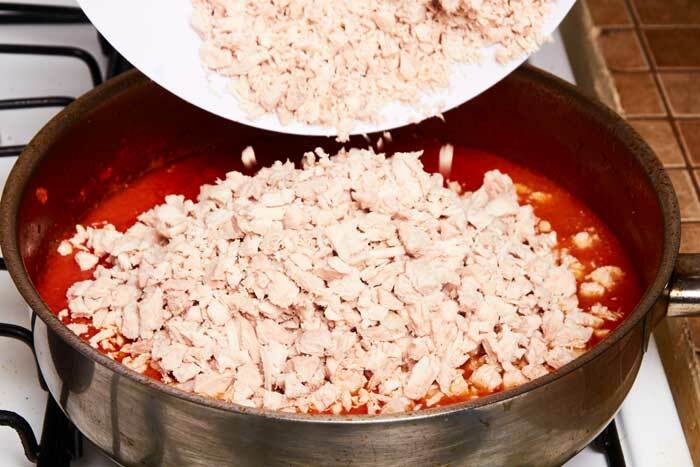 Clean any tough membrane from the pork and then cut into 1″ to 1 1/2″ cubes. 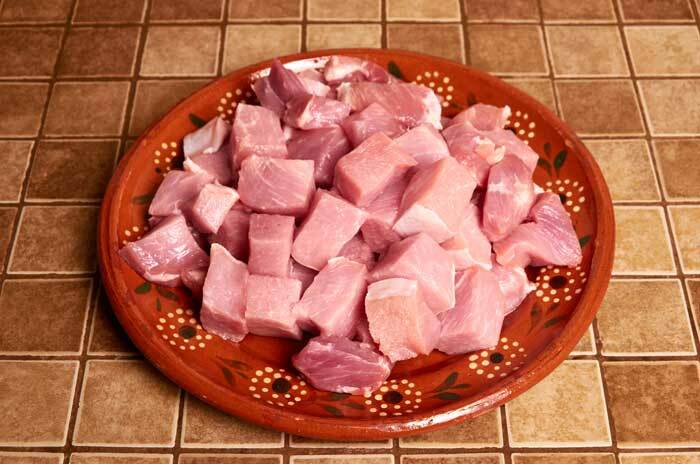 Cut the pork into cubes. You cube the pork so it cooks evenly. 1″ to 1 1/2″ cubes are fine. 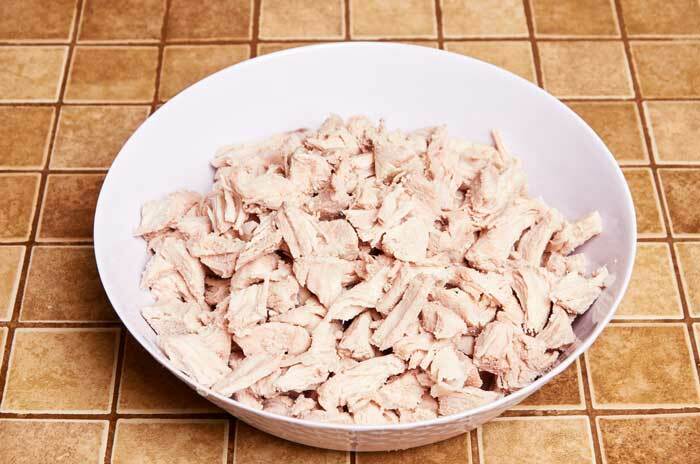 You don’t have to be too precise because you will shred and chop the meat after it is cooked. 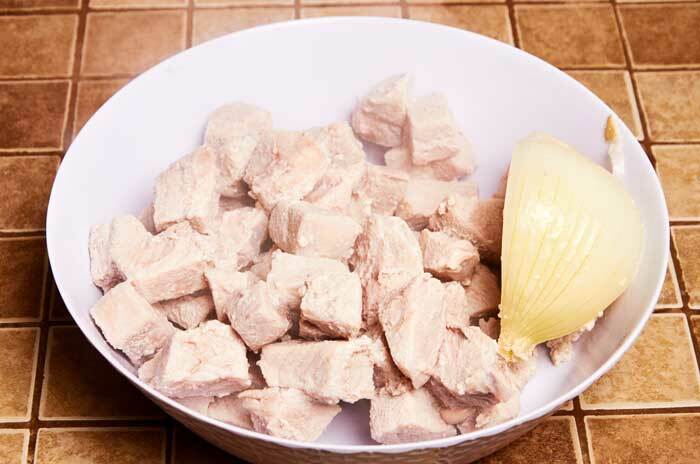 Put the pork in a pot with 1/4 of a white onion and just cover with water. 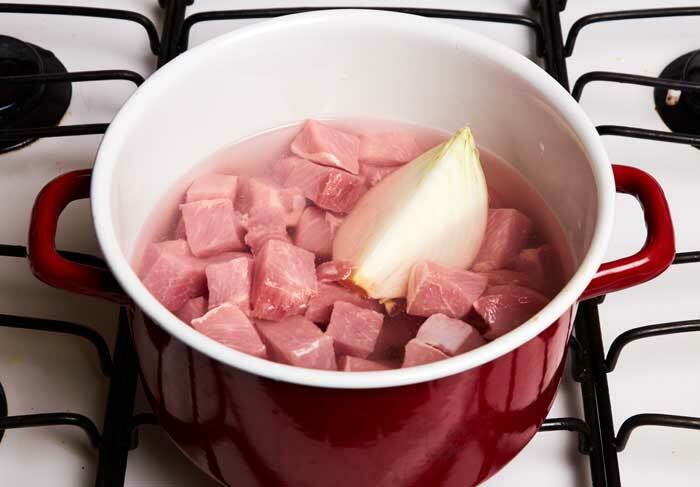 Put the pork into a pot with 1/4 of a white onion and just cover with water. 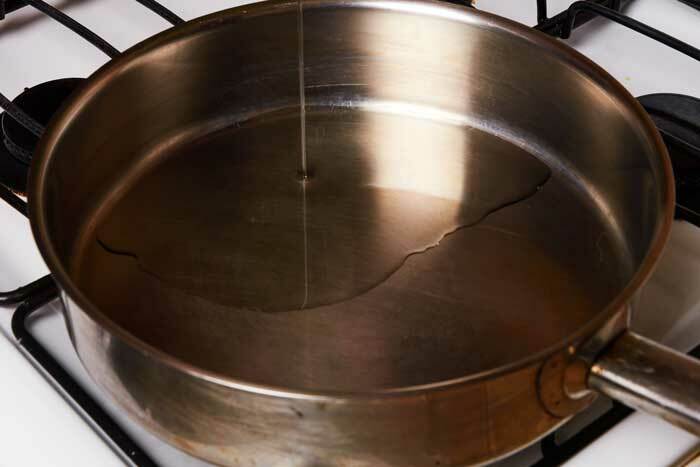 Bring the water to a boil and then reduce the heat to a simmer and cook for 35 minutes. Skim any scum that rises to the top. Remove the pork and simmer the broth to reduce it. 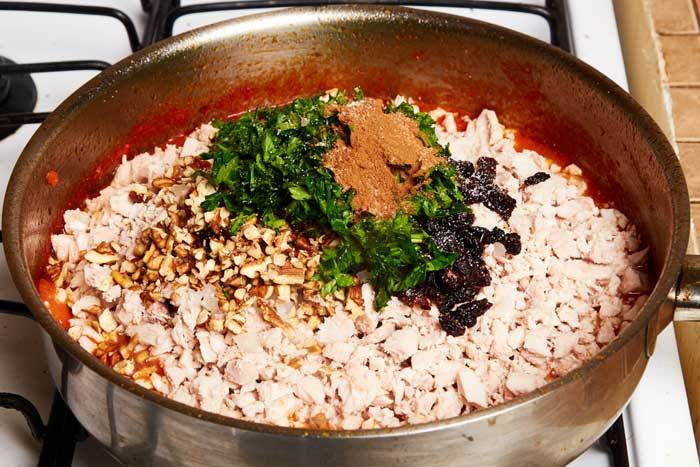 Once the pork is cooked remove it from the pot and and simmer the broth until it has reduced to about 1 cup of liquid. Reducing the broth concentrates the pork flavor. It will take about 10 minutes to reduce. You are ready to prep the filling. 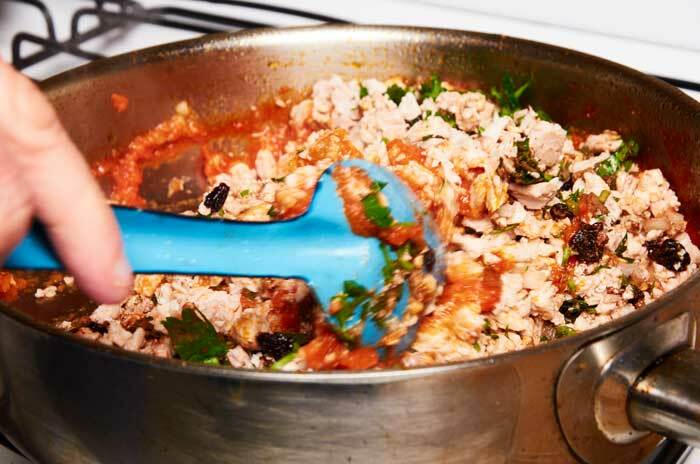 Shred the pork with your fingers. With your fingers break apart the pork into smaller pieces. Then chop the pork finely. Use a knife to chop the pork into fine pieces. 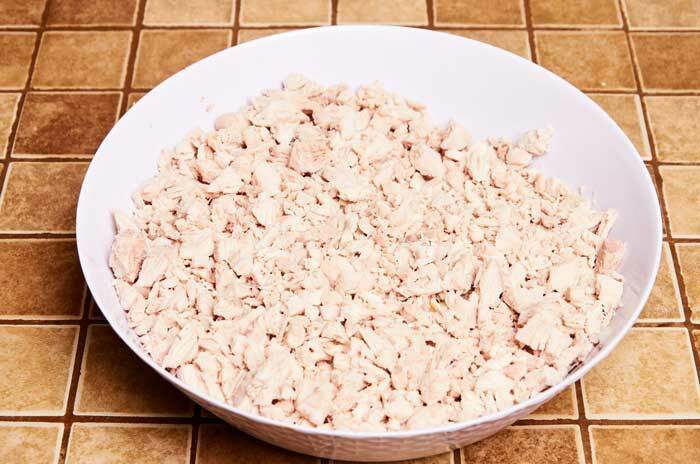 Try to cut meat into evenly sized pieces. You will make two batches of this salsa to make the chiles rellenos. 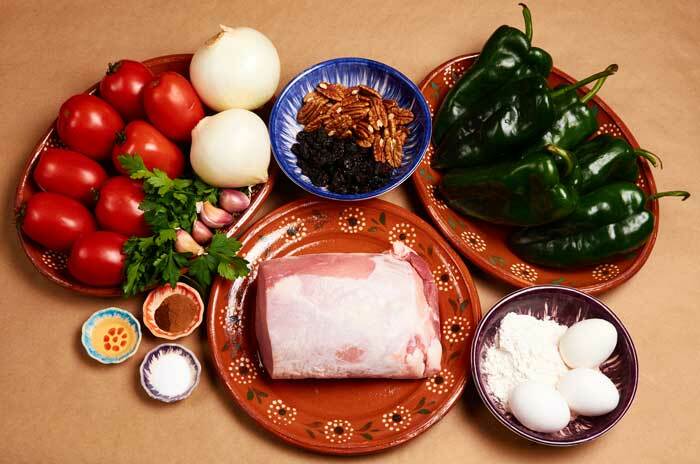 One batch is used to prepare the pork filling and the other batch is used when you serve the chiles rellenos. 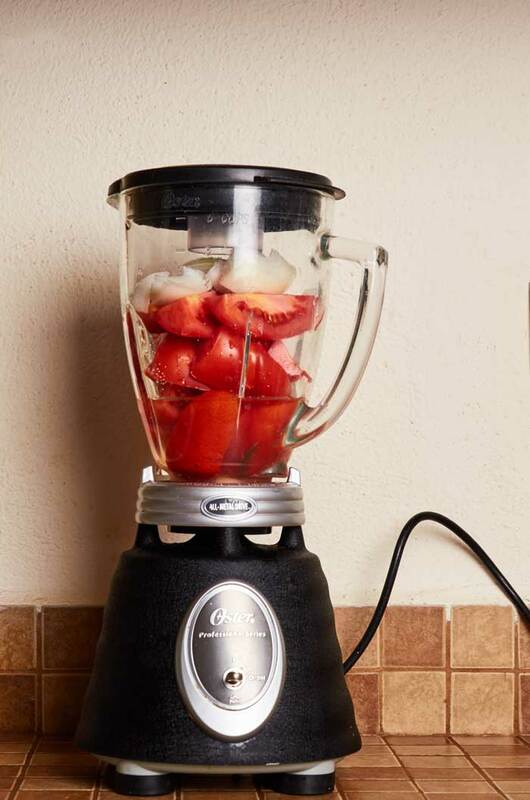 Put the ingredients in the blender jar with about 1/4 water. 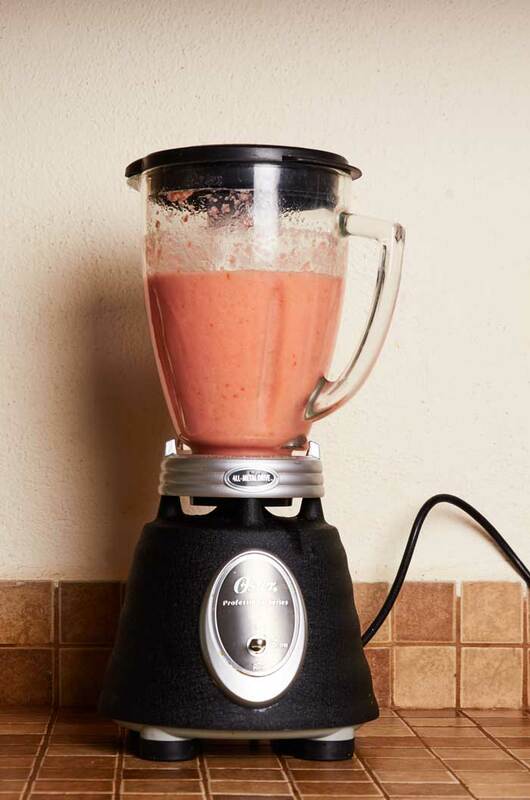 Put the salsa roja ingredients into your blender. Add about 1/4 cup of water which is just enough to help the salsa fully blend without making it watery. Blend mixture for 1 minute. Blend the salsa for about 1 minute. It should still have a bit of texture but it shouldn’t be chunky. Don’t be put off by the pale pink color of the salsa. It takes on a beautiful red color when fully cooked. 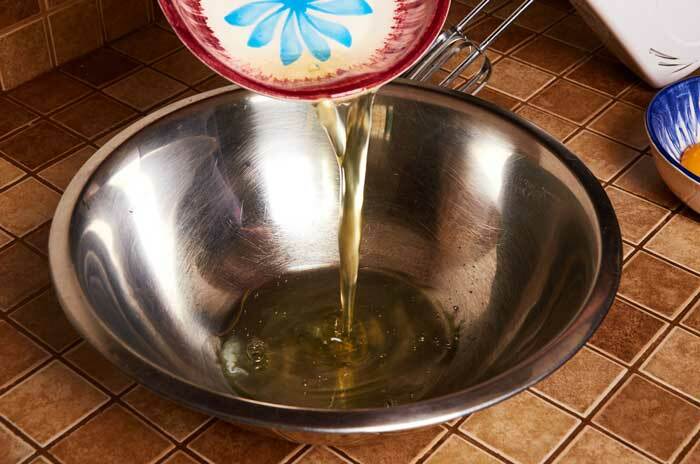 Add 2 tablespoons cooking oil to pan and heat to medium hot. Slowly pour the blended salsa into the hot oil. 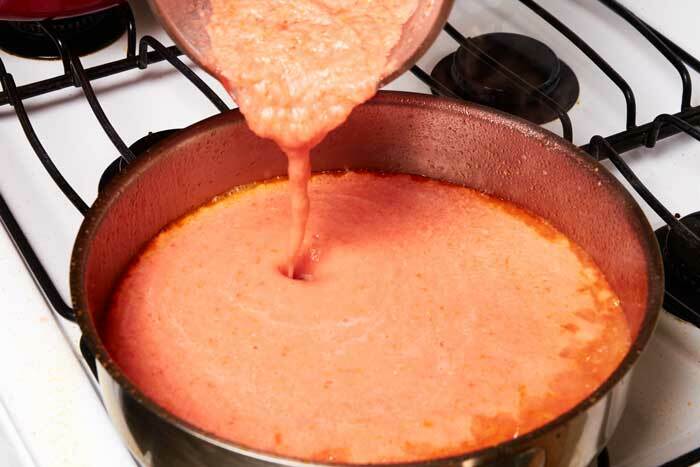 Frying the salsa in hot oil helps develop a rich flavor. To fry it, slowly pour it into te hot oil. Be careful because it tends to spatter. Simmer for 10 minutes until the salsa has thickened and darkened in color. 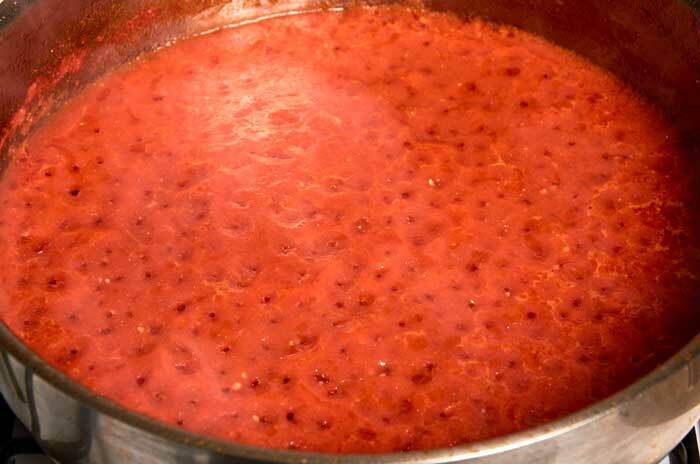 Simmer the salsa roja for about 10 minutes until it has thickened. As promised the salsa has turned a beautiful deep red color and the flavor has intensified. Add the shredded chopped pork to 1 batch of the salsa roja. 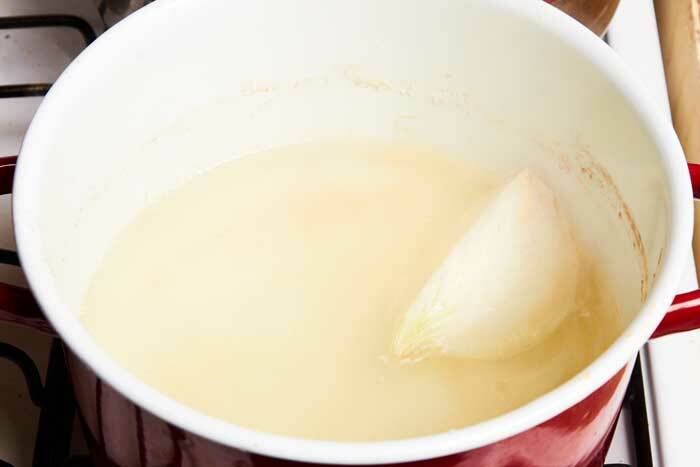 Then add the rest of the filling ingredients including 1 cup of pork broth and 2 tablespoons of apple cider vinegar. It’s starting to look delicious. 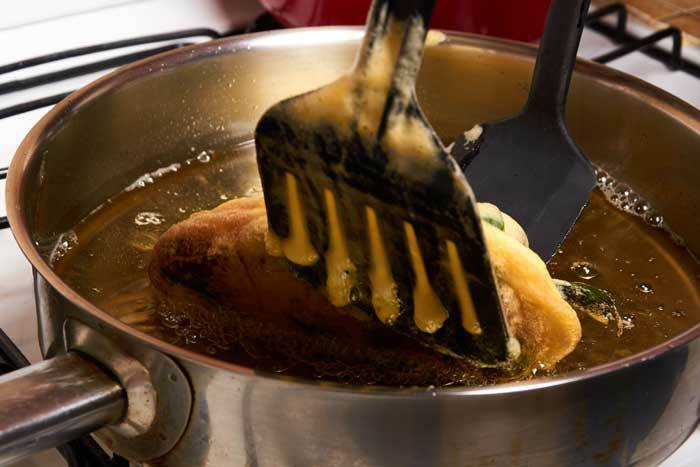 Cook the filling over low heat for about 20 minutes until most, but not all of the liquid has evaporated. You want the filling to remain moist but it shouldn’t be dripping liquid when you fill the chiles. Stuff each chile with the pork filling. Do not overstuff the chiles because you won’t be able to close them with a toothpick and the filling will spill out. More isn’t always better. You want to maintain a balance between all of the ingredients. Stuff each chile with pork filling. Use a toothpick to close the Poblano chile. Properly closed chile. The stuffing won’t fall out out of this one. 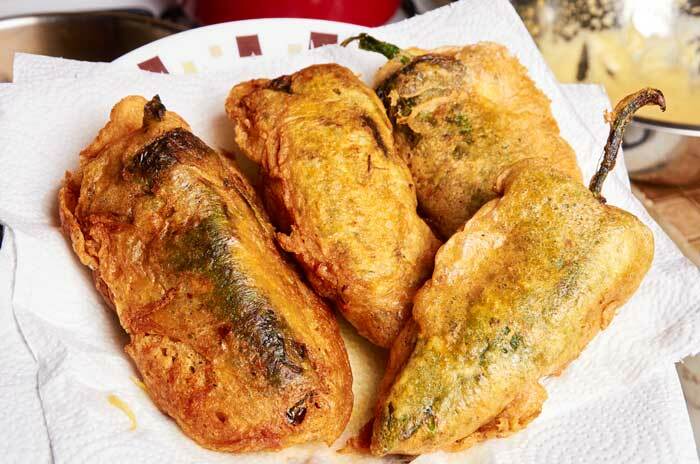 Traditional chiles rellenos are battered in a light egg batter. 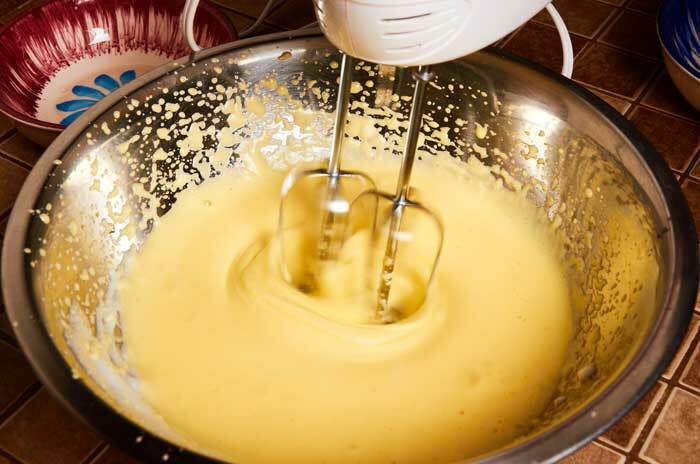 Follow these steps to make a perfect batter. Carefully separate the egg whites. If you get some yolk in the whites before they are whipped the batter won’t expand and become fluffy. 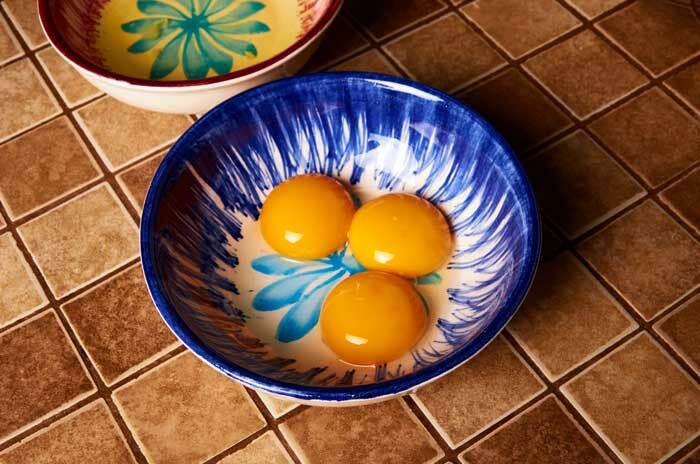 Try not to break the yolks because you add them one at a time to the whipped whites. Pour the egg whites into a mixing bowl. Start by pouring the egg whites into a large mixing bowl. 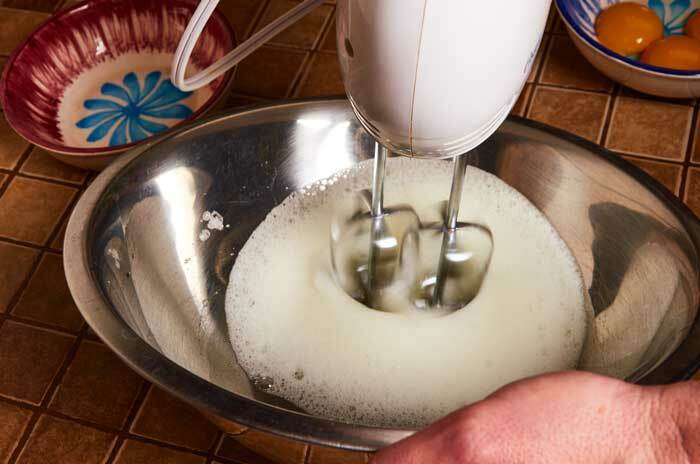 Use an electric hand mixer to whip the egg whites. Whip the egg whites with an electric hand mixer set on high. Whip until the egg whites are fluffy and coat the back of a spoon. It takes a few minutes of whipping for the egg whites to expand and become fluffy. When the egg whites have expanded greatly and the mixture starts to form peaks when you remove the beaters it is ready for the next step. Add the yolks one at a time to the whipped egg whites. 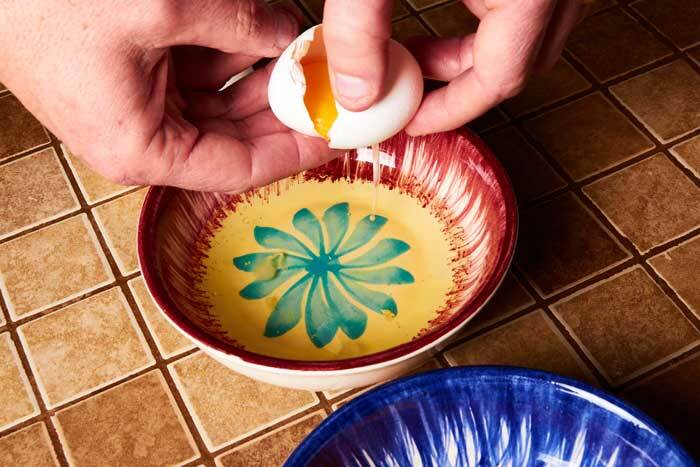 Gently slide the yolks into the whipped egg whites one at a time. Add one and when it is fully incorporated add the next one until they are all incorporated. 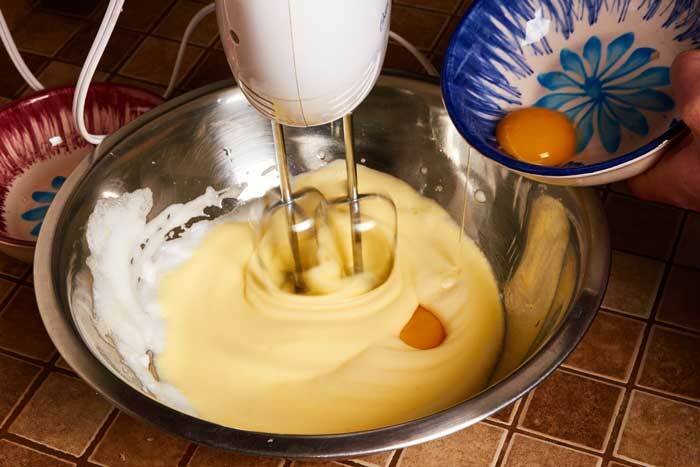 Whip until the yolks are incorporated and the batter is light and fluffy. When the batter is smooth light and fluffy and coats the back of a wooden spoon without dripping it is ready to use. If it separates while you are in the process of battering and frying the chiles just whip it with your electric mixer for a few seconds to incorporate again. Once the chiles are stuffed, it’s time to batter them in the egg batter. Flour all sides of the chile. Dust all sides of the chile with flour which helps the egg batter stick to the chile. 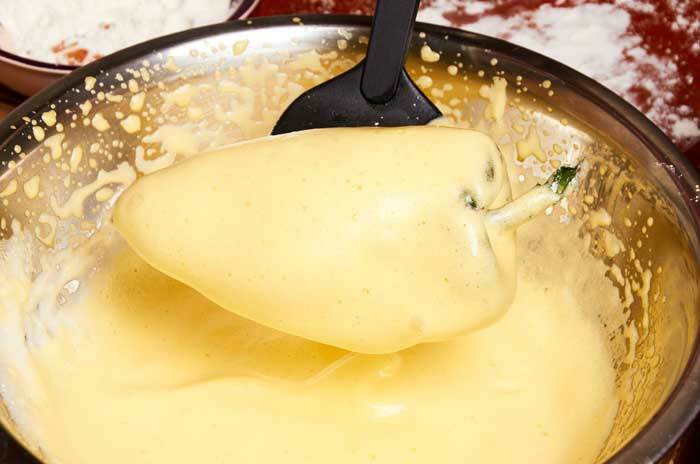 Dip the floured chile in the egg batter to cover both sides. Very gently dip the floured chile into the egg batter. Be sure to cover all of the chile in batter. Fry the chiles one or two at a time. 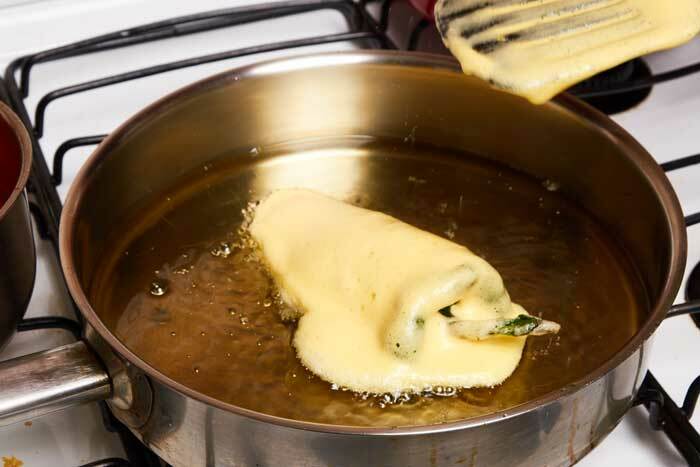 Very gently slide one of the stuffed chiles into your frying pan. Be very careful to not knock the batter off the chile. Gently turn the chile to cook the other side. When the bottom part of the chile has turned a golden color, use two spatulas to carefully turn the chile over. Be very careful to not knock the batter off the chile. This chile is ready to be removed from the oil. The coating has turned a beautiful golden brown. 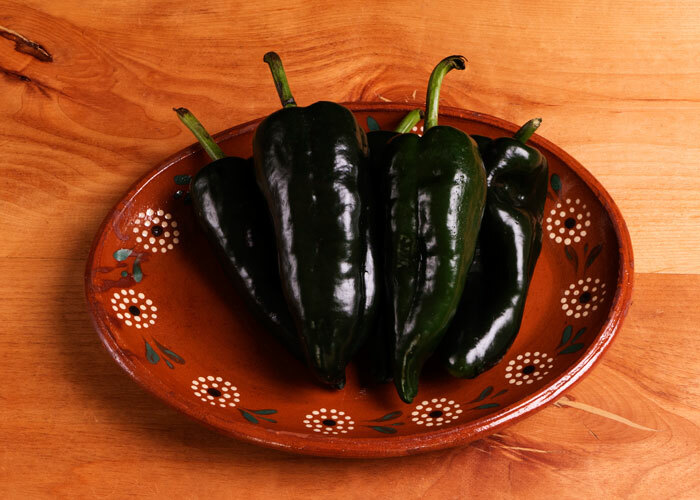 Place the chiles on a plate with paper towels to drain excess oil. Drain the chiles on a plate covered with paper towels for a couple of minutes to remove excess oil. Now comes the best part, serving and eating the chiles rellenos. To serve, spoon some salsa roja onto a plate place the chile in the middle of the salsa and then spoon a bit more salsa over the chile. It is ready to serve. Chiles rellenos are served warm not piping hot. A perfectly prepared chile relleno. 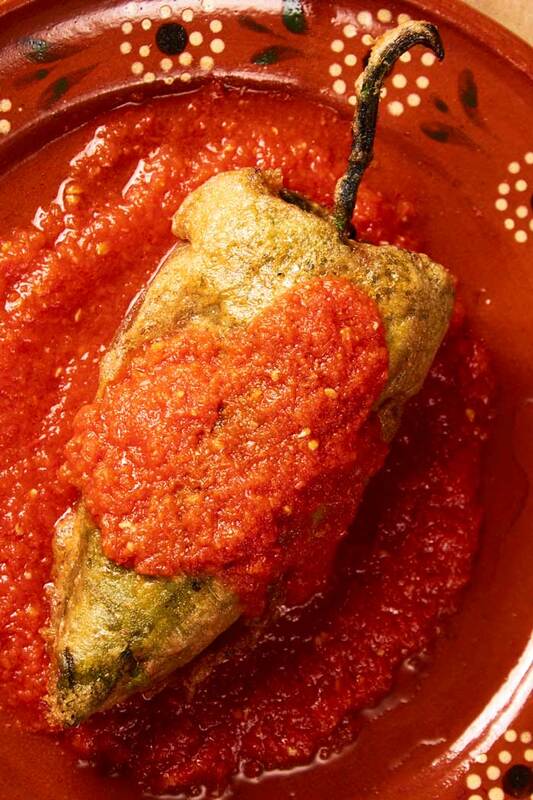 Recipe for authentic chiles rellenos, Poblano chiles stuffed with a savory pork filling. Chiles Rellenos are one of the best known and loved Mexican foods. Give this recipe a try. You won't be disappointed. Add 1 pound of roughly chopped tomatoes, 1/2 of a white onion, 2 cloves of garlic, 1/2 teaspoon of salt and 1/4 cup of water to your blender. Blend for 1 for 1 minute minute until smooth. To serve, spoon some salsa onto a plate, place the chile relleno in the middle of the salsa and then spoon a little more salsa over the chile. 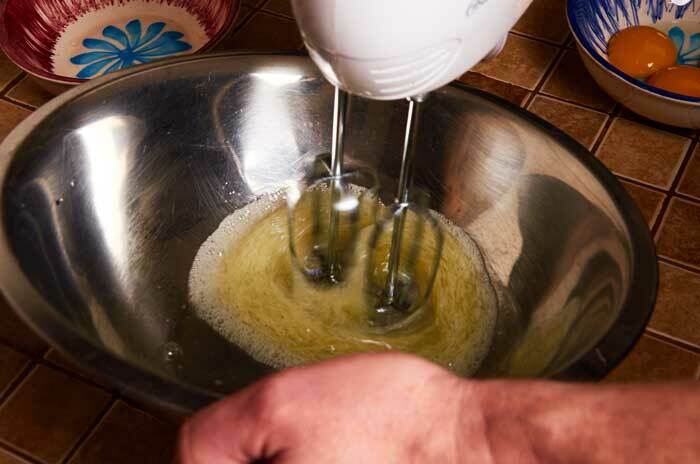 If your egg batter starts to separate while you are battering chiles, a few seconds whipping with the electric beater will incorporate it again. 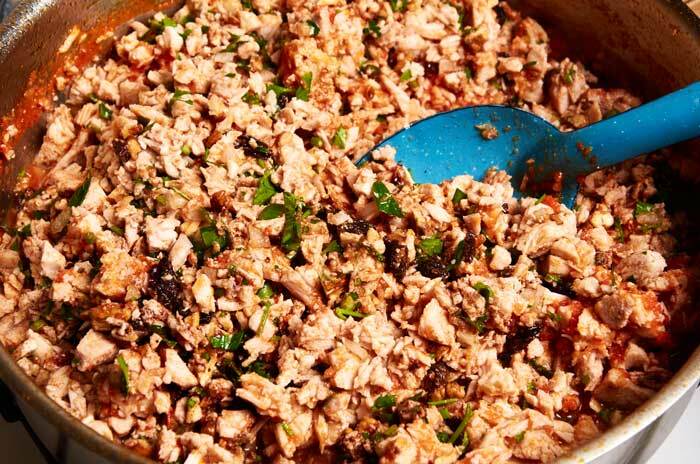 Depending on the size of your chiles, you will probably have some pork filling left over. The left over filling makes a great taco. If I wanted to make a cheese stuffed version, what kind of cheese would you recommend? Your step by step instructions make this look so easy! Thanks! Try making them with panela or queso fresco, both are fresh cheeses which are light and airy. You don’t want to make them denser aged cheeses. Why bother separating the eggs only to use a mixer to incorporate yolks? Doing it this way, you’ll lose the benefit of a fluffy and less eggy tasting batter! Bring the eggs to room temperature. Separate and whip the whites to stiff peaks. Whip the yolks until frothy. Fold the yolks into the egg whites, being careful not to deflate then. A couple turns will do. This method is also recommended when making Belgian waffles. I made the recipe tonight and made the fry batter in a few batches due to not having a big enough bowl. I tried this technique out, did not work well for frying. It is in fact too fluffy/airy and fries onto the chile like a piece of sponge. Better to get a still-airy but not meringuey batter, as per the original recipe. Cheers! Rich, why throw ice on this magnificent contribution. Celebrate and promote the positive and show us a link to your wonderful stuff. I particularly enjoyed your recipe for the seasoned pork stuffing- delicious! I have just found your site and have not yet cooked anything, but I love the presentation of the recipes and all of the great photos. Very helpful indeed. I can almost taste it. I love Chili Rellenos, though I have never made them, and yours look delicious. I will be heading out to buy some Poblanos very soon. Thank you for this wonderful recipe! I had always had Chile Rellenos stuffed with Queso Fresco until I lived in different parts of Mexico. I discovered just how amazing and varied Mexican cooking can be. What a rich heritage! WOW!!! 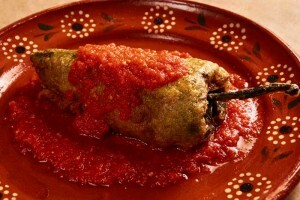 That is the most spectacular tutorial on Chile Rellenos EVER!!!! Thank you so much for putting all of your time and devotion into demonstrating how to make a proper relleno. 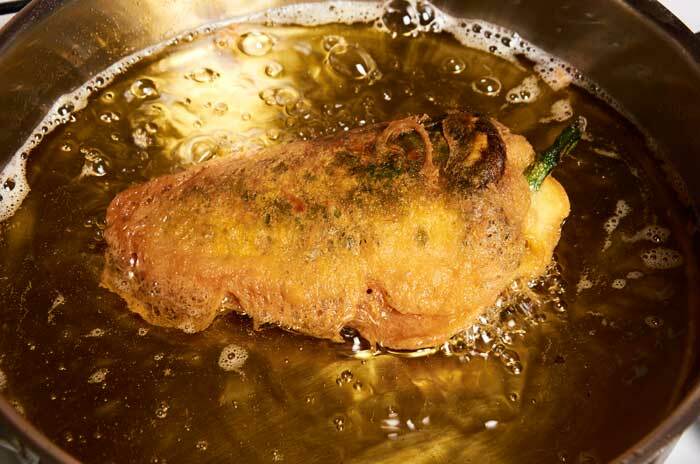 My mother used to try rellenos at every restaurant and was usually disappointed for one reason or another. This is what I have been looking for. Our whole family loves a good relleno. I loved your detailed instructions accompanied by the gorgeous photos. You obviously are a good cook if you are as meticulous as your recipe instructions. I’m going to follow your directions to the letter.